This is our extremely heavy duty commercial model suitable for markets, cafes, public open spaces, sporting arenas, carports, pools, schools and child care centres, commercial centre, - any location that requires both sun protection and water protection. 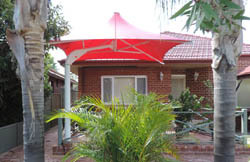 The Alfresco Umbrella has been installed in many residential applications including apartments. 1. Heavy duty steel (highest quality) frame which is hot dipped galvanised. All other steel components are electroplated to prevent rust. There are no support wires leaving a clean, elegant shape. Frame is available in a wide range of powdercoated colours. 2. Size is 3, 4, 5 and 6 metre widths. 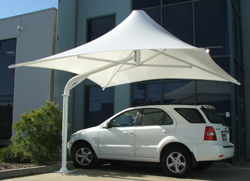 Alfresco umbrellas can be linked together, either with a soft gutter or by mechanically locking the arms or frames and making a common canopy wih multiple peaks. 3. Umbrella is 'fix and forget' design that is fully opened at all times. 4. 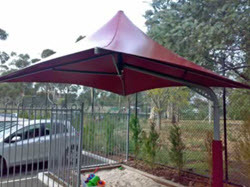 Canopy is PVC which is weather proof and long lasting. Available in Ferrari and Naizil with a large range of colours. 5. High Wind rating of W41, is designed to handle wind loads up to 148 kph, and can be manufactured to W56 wind loads to 200 kph. 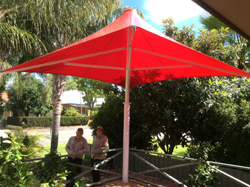 It is an extremely heavy duty umbrella and must be securely fixed in a permanent position by the installer. View our video showing Features of the Alfresco Model.